Don Polzien has been making all types of knives for over 15 years. He specializes in traditional Japanese pieces, especially Tanto Knives (short blades 12 inches and shorter). These consist of many blade styles, as well as endless varieties of Saya (Scabbards) and fittings. 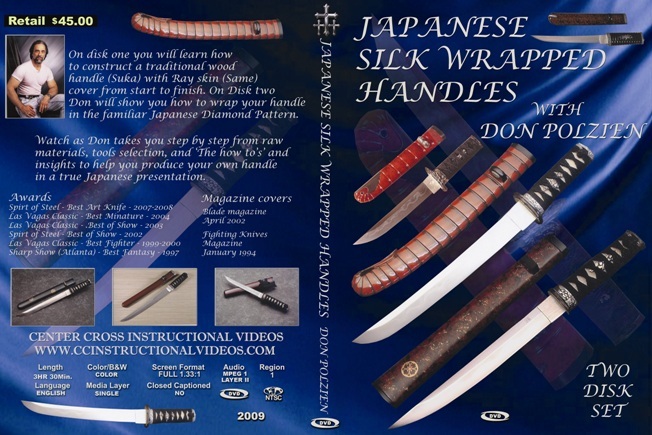 In this DVD Don will take you step-by-step from material selection to tools required as well as give you his insight on how to produce your own exotic Japanese silk wrapped handles. You will truly be amazed by the skills you will acquire from this master knife maker at work. This is a 2 disk set .